The cache is not at the posted coordinates - these are for Knaphill Baptist Church. Knaphill Baptist Church did not begin with a building, but with a family. Robert Lloyd came from Rugby to Knaphill with his wife and four young children in June 1867 to be head gardener at the newly opened mental asylum, Brookwood Hospital. He was responsible for the laying out of the grounds and gardens and planned many of the building developments. He became well known as a horticulturist. Robert Lloyd was a committed Christian and a member of the Churches of Christ. He had a passion to share his own living faith with others and, having started the church in his home, he founded “Hope Chapel” in Knaphill. The new, brick built building in the High Street was something of a landmark in the village and was described at the time as ‘the most modern building in Knaphill’. The building cost £370. The building has stood the test of time well and has been updated over the years to meet changing times. It now has electric lighting rather than oil lamps, gas-fired central heating rather than a greenhouse boiler and padded chairs rather than hard wooden forms! 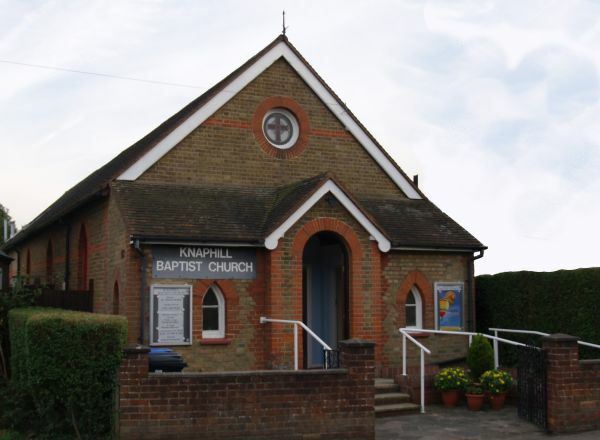 The Church became Knaphill Baptist Church in 1973. N51 19.0?? AB + C = ?? W000 37.3?? D + E + F = ?? There is some parking on the road outside the church and in the small lay-by nearby. Please take care as the road can be quite busy at times. Alternatively there are two free car parks in the village. The cache should be easy to find. It is a small container in a camouflage bag with lots of room for trackables, etc. With the local school nearby and the main road it can be quite a busy area at times and so the hint should help you to find it without having to spend too much time hunting. Congratulations to IceColdUK on FTF. Oruvaq YU fvqr bs YU obk.